Elfrid Payton, nicknamed SWAC, was born September 22, 1967 in Gretna, Louisiana. He had a standout college career at Grambling State University. In three years at the school he had accumulated 117 tackles ( 70 of which were solo), 28 tackles for losses and 16.5 sacks. He was the team’s MVP in 1988 and 1989. Payton signed with the Winnipeg Blue Bombers as a free agent in 1991. That same season, he was Winnipeg’s nominee for most outstanding rookie with 37 tackles and six sacks. During the 1993 season he was the CFL’s leader in quarterback sacks with 22. He was named a CFL All-star, as well as being awarded the James P. McCaffrey Trophy (most outstanding defensive player in the Eastern Division) for his efforts. After a brief stint with the Shreveport Pirates, Payton signed with the Baltimore Stallions. He helped the Stallions to a Grey Cup appearance in 1994 and Grey Cup victory in 1995. He was named a Southern Division All-Star for the 1995 season. When the Baltimore Stallions moved north to become the Montreal Alouettes in 1996, Payton continued with the team. In 1997, for the second time in his career Payton was the league leader in sacks with 14. 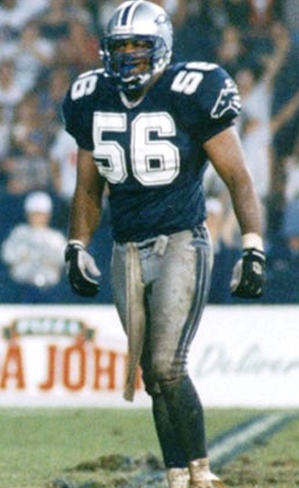 He continued to earn awards for his outstanding performance on the field being named both an Eastern All-Star and a CFL All-Star in 1997 and 1998. On July 22, 1999 during a game against the Winnipeg Blue Bombers Payton had five sacks tying the record for most sacks during a regular season game. The 1999 season would be Payton’s last with the Alouettes. After returning to the Blue Bombers for a season in 2000 and spending the 2001 season with the Argonauts, Payton signed with the Edmonton Eskimos in 2002. For a third time Payton lead the CFL in sacks, as well as being named a Western Division All-Star, a CFL All-Star and being award the Norm Fieldgate Trophy (Most Outstanding Defensive Player in the Western Division). In 2003, Payton earned is second Grey Cup victory as part of the Edmonton Eskimos team. At the time of his retirement, Elfrid Payton had 154 sacks making him second of All-Time in Quarterback Sacks. He also held the Alouette’s team record for most sacks with 52.